The old saying goes, "There's safety in numbers." This was never more true than when discussing the model numbers 480 and 466. These two numbers represent laundry room safety. When used together, the Dryerbox 480 behind the dryer, and the DryerJack 466 used in rooftop dryer duct termination, means that you have not only impeccable taste, but you are also concerned for the well-being of your home. The Dryerbox 480 gives you space for your DryerFlex hose to rest easily behind your dryer, meaning no more crushed hose! The lint from your dryer is swept away without a damaged tunnel slowing it down. This can be used in either up or down venting, which makes it the most versatile of all of the Dryerbox models. The DryerJack 466 is a low profile roof venting termination. Unlike other roof vents, this beauty features a patented design that gives you maximum airflow efficiency without compromising on the protection from the elements. Airflow efficiency translates into faster drying time in addition to providing a faster means for lint to escape, lessening the risk of a dryer fire. 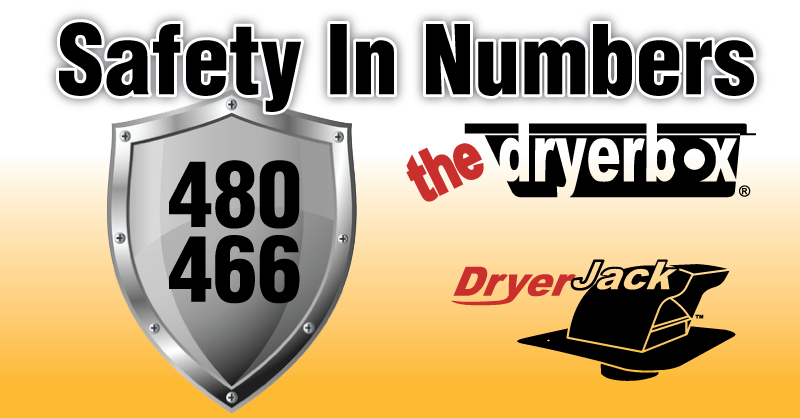 Used in conjunction, the Dryerbox 480 and the DryerJack 466 helps to prevent fires, so there IS "safety in numbers!"